We're in for a real special treat today! 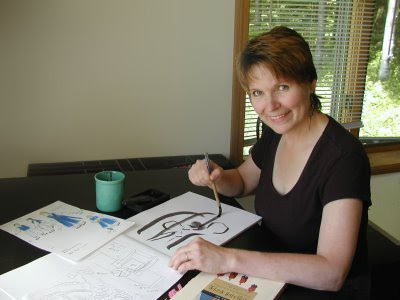 Today, I have the honor and great pleasure of interviewing Anne Sibley O'Brien, an American author/illustrator who creates multicultural children's books. Anne is involved in diversity education and leadership training. She is also a performer and has created a one-woman show entitled “White Lies: one woman’s quest for release from the enchantment of whiteness” (http://www.WhiteLies.ws). She lives with her husband in Maine, and is the mother of two grown children. What was it like growing up an American in Korea? Do you remember the culture shock you experienced when you first moved to Korea? Did you experience culture shock again when you moved back to the U.S.? Memories of my earlier years are fuzzy, but from the time I turned seven and we left New Hampshire to move to Korea, it's as if someone turned on a video camera - I have a continuous set of images of this most definitive event in my life. I'm sure that there was considerable adjustment for me as a young child, losing one world and encountering a completely new culture and country, but children take their cues from their parents, and mine framed the whole thing as a grand adventure. In moving to Korea to serve as medical missionaries, they were both fulfilling a lifelong dream. 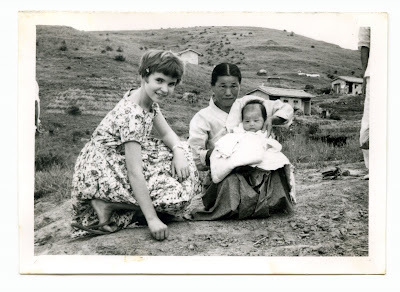 Our family - my parents, my two brothers, my baby sister and I - arrived in Seoul in 1960, seven years after the end of the Korean War and the partitioning of the peninsula into North and South Korea. It was a difficult time as people struggled to recover from the devastation and figure out how to survive in its aftermath. We often saw young children dressed in rags, begging on the streets. Over the twenty years that it was home, we witnessed the miracle of South Korea's development and modernization to become one of the world's most industrialized nations, which instead of increasing the gap between rich and poor, actually benefited all of the country's citizens. So the Korea I knew as a child was dramatically different from the country I lived in as a young adult, and the country I visit today - the changes are just so fantastic. 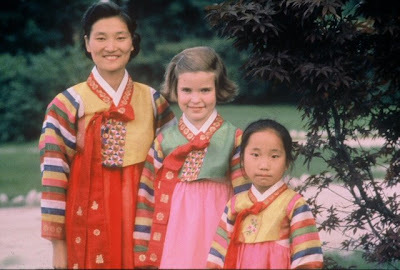 Growing up as an American in 1960's Korea was kind of like being a princess. South Koreans were deeply grateful to the U.S. for its role in the war; at the time it was probably the most pro-American country in the world. There were few foreigners and we were extraordinarily privileged and visible. When I went to the market or anywhere in public, I attracted a crowd of children and adults who were fascinated by how different I looked: my light brown hair (like "gold! "), my large round eyes, my big nose, my height. But the attention was so friendly, so full of awe and wonder, that it became the catalyst for my own passion for human difference and connection. In their dream, my parents had envisioned working side-by-side with Koreans as colleagues, so they were dismayed to discover that missionaries in 1960 were housed in turn-of-the-century three-storey brick houses up on hills, on compounds surrounded by barbed wire. The second significant thing that happened, after moving to Korea, was my parents' choice to live in a Korean house, which they managed by the time I was nine. 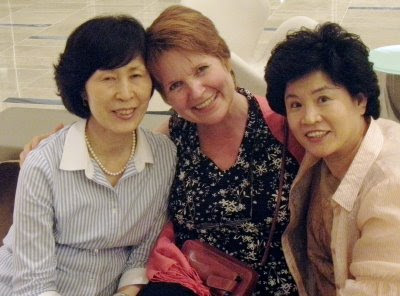 That changed everything about our relationships with Koreans, some of whom became dear friends and extended family. I also had a number of experiences of total immersion in Korean life and language, including a year at a Korean university, so I became - and remain - bilingual and bicultural. Growing up in Korea meant belonging to a place I did not belong, being of a place I was not from, being welcomed and loved by people who were not "my" people. Somehow, culture shock and the sense of dislocation always felt more intense when I returned to the U.S., to the place I supposedly belonged, to the place I was from, to "my" people. What are some of your strongest memories from when you were living in Korea? - Falling in love with Korea's culture and traditions: the graciousness and generosity with which guests are welcomed; the brilliantly-colored designs on the underside of palace or Buddhist temple roofs; the charming and cunning cast of animals animating folk stories and folk art - dragons, rabbits, tigers, goblins, magpies; the bold colors and graceful sweep of the traditional hanbok, with its long skirt and half-moon-sleeved top; the love of children and reverence for elders. - Sleeping on a thick padded quilt on the floor, heated in winter, with another heavy quilt over me, my body toasty, cool air on my face. Eating meals - Korean rice and side dishes, American stew or spaghetti, or a mix - seated on cushions around a low table. - Family vacations with Korean friends spent enjoying the country's natural beauty: tall twisted pines along a rocky seacoast, terraced rice fields climbing a hill, mist enveloping the base of craggy peaks. Eating picnics of kim-bap - rice, egg and vegetables wrapped in seaweed - and cucumber sandwiches, seated on the large flat boulders beside a mountain stream, in between wading or swimming in the deep pools of icy water. - Navigating between worlds: riding through Korean streets in the LandRover that took us to school where we studied an American curriculum in English (at an international school founded by missionaries in Seoul, and a military dependent school on an Army base in Taegu); or walking up the alley steps past makeshift shacks and an open sewer, then through the compound gates to play with missionary friends in the ease and beauty of their lawns and gardens. What kind of young reader were you? What were your favorite books? Who were your favorite authors? I loved books. Probably my three favorite things were people, drawing and reading. I have a vivid memory from when I was eight, living in Seoul, and my mother, brothers and I caught a lingering virus that kept us bed-ridden for weeks. A woman who called herself the Story Lady came to visit with a pillowcase of books over her shoulder. Magical. Once or twice a year, we got to order used books from a church warehouse in the States. We checked them off on a master list, mailed off the order, then waited months for the package to be delivered by sea mail to discover whether or not we'd gotten the ones we'd wanted. Books were precious. My mother read to us a lot, classics like WIND IN THE WILLOWS, WINNIE THE POOH, the NARNIA books and LITTLE HOUSE ON THE PRAIRIE. We had an extensive library of marvelous picture books like BLUEBERRIES FOR SAL, Taro Yashima's UMBRELLA, and the delightful Little Golden books illustrated by Eloise Wilkins. I was a romantic child, and I loved books about babies, princesses and fairies - an antique book I got from the order service called JIJI LOU, about a doll who makes a home for abandoned baby dolls; BABY ISLAND; FLOWER FAIRIES; THE GOLDEN BOOK OF FAIRY TALES illustrated by Adrienne Segur. In junior high, my favorite book was a fairy tale, TATSINDA by Elizabeth Enright, with pictures by Irene Haas, who became one of my favorite illustrators. As a teenager, I loved the novels of Madeleine L'Engle (especially the Austin books) and Katherine Paterson's novels set in Asia. How has growing up in Korea molded you as a person? Aside from being born into my family of origin, growing up in Korea was the single most formative event of my life. I was seven years old, that time in development when a child is moving from sensing oneself as the center of the universe to having a look around at the rest of the world, so it had a huge impact. The greatest gift is the certainty that we are all connected, that all human beings belong to each other as members of one family. I think I sensed this as a young child, but it was confirmed by the direct experience of being embraced by people who were different from me, yet claimed me as their own. My early experiences were the inspiration for my desire to explore the glory of human difference, to portray racial and cultural particularity in such a way that we can all see the beauty of other ways of being. Having the reference points of two often contrasting languages and cultures is wonderfully mind- and heart-expanding. I've also exercised my mind and heart working at the puzzles of race, economic class, and privilege. All the attention I got as a child for my visible difference made me intensely aware of my own race, which is an unusual perspective for a white American. When I came back to the States for college, my culture shock propelled me into an exploration of racism and whiteness that has became a lifelong passion. What was your path to publication as an author/illustrator for children? I started off as an illustrator. By the time I finished my studio art major at Mount Holyoke College and moved back to Korea, I was leaning towards children's book illustration as my chosen art form. In 1978, just married and living in the States, I set up a course, "Writing & Illustrating Children's Books," taught by Eric Carle, for the teacher-community center in western Massachusetts where I worked. During that wonderful series of classes, I decided that this was exactly what I wanted to do, even if it took ten years to break in (I would have been astonished to know that it would take seven). I put together an illustration portfolio and over the next seven years, took it around to art directors and editors at New York and Boston publishers, attended conferences, and used what I learned to keep improving my work. Finally, in 1985, I was in the right place at the right time, when an editor told me he wanted to publish a series of board books on toddler conflicts. As the mother of a two-year-old son, I was primed and ready to respond. Holt Rinehart published the first set of four, which I wrote and illustrated, in 1985, the second set a year later (all long out of print, but still sometimes found in libraries). In between, I illustrated my first picture book, JAMAICA'S FIND, by Juanita Havill. Nine books in eighteen months!! Then three long years went by before my next contract, another JAMAICA book. During that fallow time, I started to take my writing much more seriously, first in order to develop manuscripts that I could illustrate, then for its own sake. What inspires and motivates you to write and illustrate for children? By the time I was seven, I was announcing to the world that I was going to be an artist when I grew up. I drew constantly - filling sketchbooks, doodling all over my math papers, trading sketches of babies for American candy from my Army kid classmates. Those early picture books were an inspiration - I loved illustrations of people's faces, which was also my favorite thing to draw. In fourth grade, I used to write stories for fun after school, making up the kind of families I wished I lived in - with lots and lots of children, not just four. At Mount Holyoke, where the art department was exclusively fine arts, it became clear that I was more drawn to applied arts, and my advisor gave me a piece of wisdom: "The task is to find work that sustains you, that you can sustain." To this day, most of the ideas I have for creative projects come in a form that works for young people, though they cover the spectrum from board books to young adult novels. "I get paid to write stories and make pictures," I tell groups of schoolchildren. "Isn't that a cool job?" I'm blessed to say that, so far, my work sustains me, and I can sustain it. What is your creative process when you are writing and/or illustrating a book? I always hold this intention for my creative process: "I will listen, receive impulse, and follow it through response into form." My working principle is that everything has more substance and power when it comes through me rather than is directed by me. I hope to let images and ideas rise up from the unconscious rather than being consciously produced. In concrete terms, when I'm illustrating a book I start with very rough thumbnails, then move to storyboard and dummy, often cycling through this process several times before reaching final illustrations. If I'm also writing the picture book, it may move from text to images back to text, in any order. Each book seems to have its own unique journey, its own needs. When I'm writing longer manuscripts, I never move through the story in a line from beginning through middle to ending. Instead, I write whatever scene feels lively, wherever the energy is moving. I can juggle many projects at a time when I'm working on them informally, but not once I'm on a schedule, limited by a deadline. I always think that when I'm doing final illustrations, I could also be working on revising a novel on the side, but it never seems to work out that way. Apparently, I can only work intensively in one medium at a time. How has growing up in Korea influenced your writing and illustrating for children? In addition to all the ways I've mentioned, it's provided source material for a number of my books - THE PRINCESS AND THE BEGGAR (Scholastic 1993, out of print) and THE LEGEND OF HONG KIL DONG: THE ROBIN HOOD OF KOREA, plus a forthcoming book I illustrated, WHAT WILL YOU BE, SARA MEE? (Charlesbridge 2010) by Kate Aver Avraham, about a Korean-American first birthday, and four of my current projects. 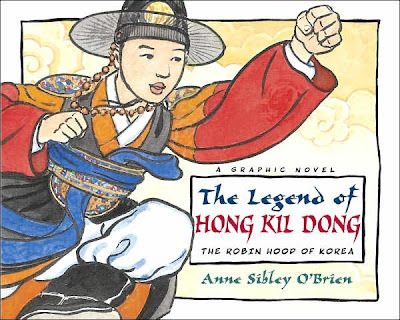 THE LEGEND OF HONG KIL DONG, a hero tale in graphic novel form, is my most decorated book, receiving the Asian/Pacific American Literature Award, the Aesop Award, and the Global Korea Award, and named to Booklist's "Top 10 Graphic Novels for Youth 2007." What are the challenges and rewards of being an author/illustrator for children? The biggest challenge for me is the sustaining part - economically, that is. I often say that the finances are as creative as the work. I put together a living (and I'm incredibly lucky to actually be able to do this) from advances, royalties, school visits, other writing and illustrating gigs like emergent readers, and other bits and pieces of income. Of course there are creative challenges with the work itself, each book seeming to present its own new set, but that's what makes it worth doing: it's not easy. The rewards include: doing work I love; having the freedom of a totally varied and flexible work schedule which I am in charge of; going to work in my pajamas; getting paid to dream and imagine and play as well as write, draw and paint; being part of a creative team with editors, art directors, marketing people; interacting with audiences of young people and adults, some of whom have read my books(! ); connecting with other children's book creators; royalties, still coming, even on one book published twenty-four years ago; and having a really cool response when people ask, "What do you do?" Can you tell us a bit about your book tours, school visits, or workshops? I'm an extrovert and a performer, so the presentation part of book marketing is fun for me. I've done hundreds of school visits across the U.S. over the last twenty-five years. I do between fifteen and thirty days per year, I'd guess, mostly K-5, but sometimes middle school and occasionally high school classes. 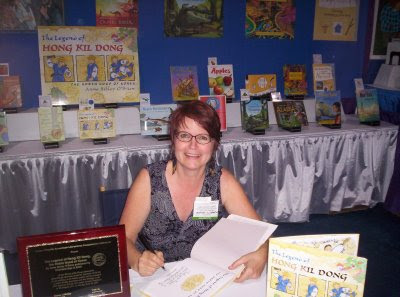 Programs include joint author-illustrator presentations with Margy Burns Knight for TALKING WALLS and our other books, and solo visits as the illustrator of the JAMAICA books (author Juanita Havill lives in Arizona, but we did manage one week of joint school visits this year) or talking about creating THE LEGEND OF HONG KIL DONG: THE ROBIN HOOD OF KOREA. I also do specific content workshops such as "Composing Comics: The Power of the Frame," "Visual Literacy," and "From the Heart: Illustrating Across Cultures." 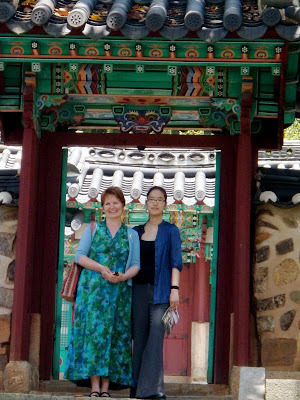 I appear at conferences, writers' workshops, and events such as the Kennedy Center Multicultural Book Festival; spend a week each summer as the Creative Writing teacher at a Korean cultural camp in New Jersey; and have twice presented at my high school, Seoul Foreign School in Korea. I'd love to do more international schools. There's lots more information about appearances, including some of the programs I offer and a complete list of the schools I've visited over the last three years, at my website, AnneSibleyOBrien.com. What are some of your favorite experiences from your book tours, school visits, or workshops? - Looking out at a roomful of children - all those beautiful faces! - Who knew you could fascinate entire classrooms of American fourth and fifth graders with 15th century Korean history, including the invention of the Korean alphabet? - Hearing students say as a program is ending that all they want to do is go write or draw. - Connecting with Korean-American students - I start speaking in Korean and they nearly fall out of their chairs. I have about twelve of my own projects at various stages of development: two teenage novels (one set in Seoul, the other in North Korea), two graphic novels (both with Korean content), two long-term memoir projects, four picture books, and a couple of others at the concept stage. 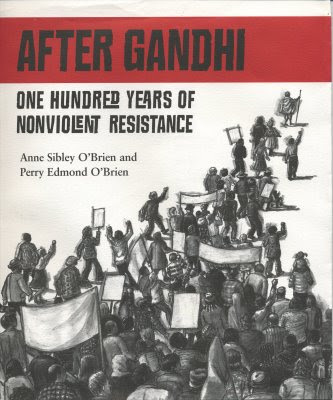 This fall I'll be illustrating a picture book, THE MOON WATCHERS (Tilbury 2010), written by an Iranian-American friend, about a family celebrating Ramadan in the U.S. And I'll be promoting two new books: AFTER GANDHI: 100 YEARS OF NONVIOLENT RESISTANCE (Charlesbridge 2009), which I co-wrote with my son, and the seventh in the JAMAICA series, JAMAICA IS THANKFUL (HMH 2009) by Juanita Havill. If you were to visit the Philippines, would you a) visit white sand beaches and underground caves, go sailing, go snorkeling and scuba diving, etc. ; or b) check out the natural wonders above ground, like the Taal Volcano, the Banaue Rice Terraces, and the Chocolate Hills. Why? Beautiful landscapes feed the eyes and the soul, so I'd certainly look for a dose of natural wonders (a and b), but my first choice would be meeting Filipinos, interacting with them and seeing how they live. Then I'd want to see and do whatever they recommended to introduce me to their country. And I'd want to spend time in markets selling handcrafts. What is your message for your readers in Asia? Wow, I have readers in Asia?! I'd love to be invited to your school, library or conference. I've been to India, Nepal and Hong Kong in the 1960's, otherwise only to Korea and Japan. I'm eager to experience other Asian countries. And 안녕하세요 to anyone from Korea! Anne, thank you so much for sharing your experiences, work, and insights with us! It was such a pleasant surprise coming across this interview of Anne. I am a Korean American and a student at Mount Holyoke College and Anne's story was just fascinating! 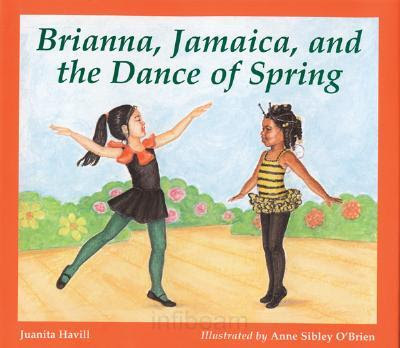 I am so happy that there is a writer/illustrator like Anne out there working on multicultural children's books. Thank you! Wow! What a superb interview! Fascinating story about her growing up bilingually and biculturally. And her accomplishments are amazing -- a human dynamo! Thanks Tarie and Anne! (Somehow, I stopped receiving Into the Wardrobe posts in my LJ feed -- so I've missed your most recent posts -- I'd been wondering why you hadn't blogged in so long. :D I added you back and hope it works from now on. I don't want to miss anything). Hi, Jama! Aww, I am glad that I am back in your feed. I love hearing your thoughts! And yes, Anne is so interesting! I can't wait for her YA novels and memoirs to come out.